We gathered in a slight drizzle out-side Bach Ma Temple at nine in the morning. Our walking tour of the Old Quarter was about to begin. We walked through a courtyard into an inner hall, at the temple in which was an elaborately adorned horse in faded white. Bach Ma means white horse, our guide said, adding that it symbolised the one that, according to legend, Ly Thai To dreamt of after trying unsuccessfully to build the walls around Ha Noi citadel. The king ordered his workers to build the walls along the path the horse had chosen, and they stayed up. As someone from a Christian background, I found it an odd custom to be worshipping a white horse, or the spirit of one. I am familiar enough with Buddhism, and the worship of Buddha. But a white horse? This aspect of Vietnamese culture was highly intriguing. It is not just legendary spirits, actual historical figures are also worshipped, the guide said. We were told that the script on one horizontally hung wooden panel read: Extremely miraculous temple of the White Horse. People pray to spirits resident in the temple for miracles to grace their lives, we were told. Not much different from praying to St. Anthony for help in finding lost keys or money, or to Our Lady of Fatima for a medical cure, I thought. Amidst the differences in practices, there were similarities as well. I also found it interesting that the building had been rebuilt several times. This has happened with many temples that were first built centuries ago in Viet Nam. In the West, people move heaven and earth to preserve such buildings, but here, people seemed to have no qualms about rebuilding a crumbling structure. No looking back. To me, this spoke of gracious detachment, an acceptance that change is just the way of the world. On one side of the inner hall, a guide showed us statues of three Mother Goddesses. The Vietnam-ese worship Mother Goddesses, of the Sky, Water and Forest. In the Catholic faith, it is fervently pointed out that Mother Mary is not a God. I do not really know the origins of this belief, but the Church forbids the worship of Mary, though Christians do pray to her. In Viet Nam, there appears to be no problem worshipping Mother Goddesses. Among other things, it struck me that there was greater gender parity here, at least among the deities. Our next stop was a temple rarely visited by tourists called Huong Nghia. It is dedicated to a military general who fought against the Chinese. Again, though I found it odd at first to dedicate a temple to an actual person, I also realised that people of the Christian faith also pray to dead relatives, to intervene with God on their behalf. 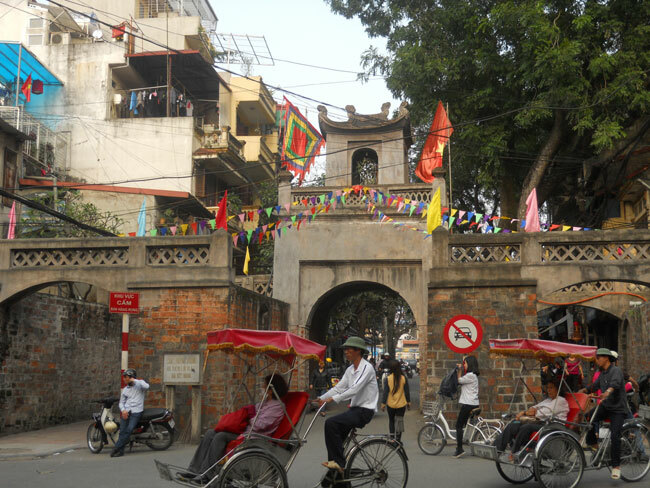 A short block away was Quan Chuong, a city gate that amazed me. When Ly Thai To walled off the Ha Noi citadel, he built 16 city gates along the perimeter. The only one that remains today stands on Quan Chuong (city gate) Street. I had been living here a year, but did not know of this gate. While the structure is not the original one built by the emperor, it still carries so much history. Even less known is the black tablet on one inner wall of the gate with inscriptions in Nom, the original Vietnamese script. Expecting it to mention great historic events or perhaps an imperial decree, I was pleasantly amused to learn that its likely meaning is, "funeral processions should not be taxed when passing through the gates" – a very pragmatic announcement. Further north, the Huyen Thien Temple on Hang Khoai Street is especially unique in being a chua (Buddhist pagoda), a den (Taoist temple) and a dinh (community hall) at the same time. Such a combination would be inconceivable in Western society. There were two other stops on our tour – a traditional house on number 87 Ma May and a jewelry communal house on 42 Hang Bac, each with its own attractions and stories.